The production of adult-born neuron is an ongoing process ­accounting ∼10,000 immature neurons migrating to the olfactory bulb every day. 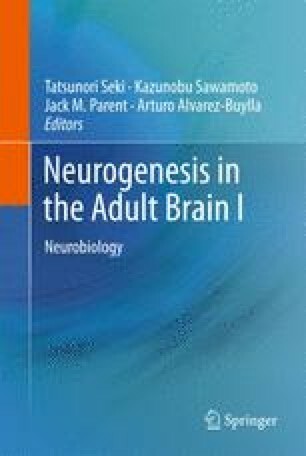 This high turnover rate necessitates profound control mechanisms converging onto neural progenitors and neuroblasts to achieve adequate adult-born neuron production. Here, we elaborate on a novel epigenetic control of adult neurogenesis via highly coordinated nonsynaptic cell–cell signaling. This communication engages the neurotransmitters GABA and glutamate whose extracellular concentrations depend on neuroblast number and high affinity uptake systems in neural stem cells. Neuroblasts release GABA providing a negative feedback control of stem cell proliferation and instructing them on the size of the neuroblast pool. Recent findings show an unexpected mosaic expression of glutamate receptors leading to calcium elevations in migrating neuroblasts and differential role on their development. Remarkably, stem cells act as lighthouses releasing glutamate onto neuroblast sailing by, thus providing migratory, survival, and proliferative cues. Finally, we propose that the timing of neurotransmitter release and their spatial diffusion will determine the convergent co-activation of neuroblasts and stem cells, and provide a steady-state level of neuron production. Upon external impact or injury this signaling may adjust to a new steady-state level, thus providing nonsynaptic scaling of neuroblast production. This work was supported by grants from the National Institute of Health (NS048256 and DC007681, A.B.) and Yale Brown-Coxe fellowship (J-C.P. ).